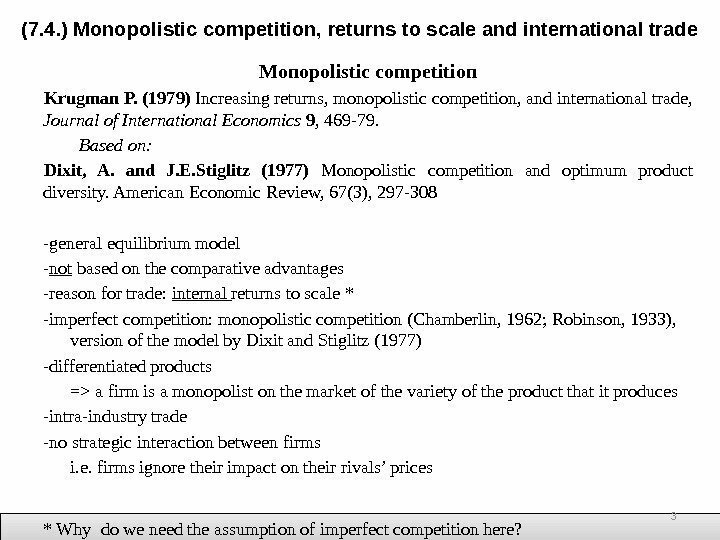 Monopolistic competition Krugman P. (1979) Increasing returns, monopolistic competition, and international trade, Journal of International Economics 9 , 469 -79. 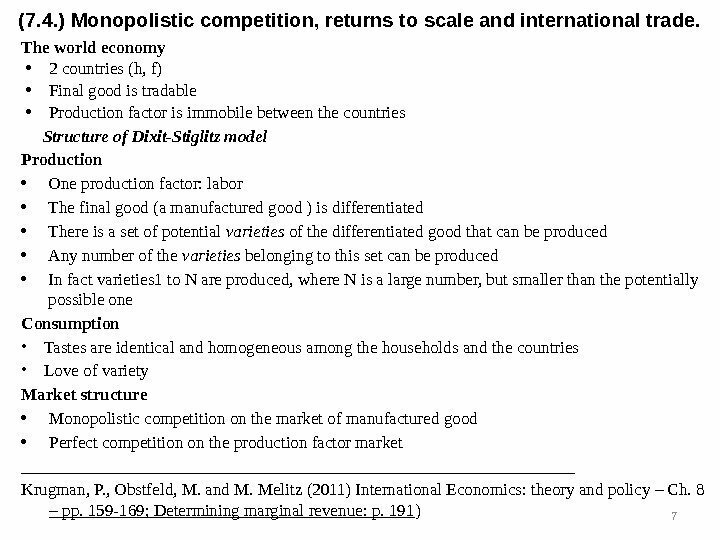 Based on: Dixit, A. and J. E. Stiglitz (1977) Monopolistic competition and optimum product diversity. American Economic Review, 67(3), 297 -308 -general equilibrium model — not based on the comparative advantages -reason for trade: internal returns to scale * -imperfect competition: monopolistic competition (Chamberlin, 1962; Robinson, 1933), version of the model by Dixit and Stiglitz (1977) -differentiated products => a firm is a monopolist on the market of the variety of the product that it produces -intra-industry trade -no strategic interaction between firms i. e. firms ignore their impact on their rivals’ prices(7. 4. ) 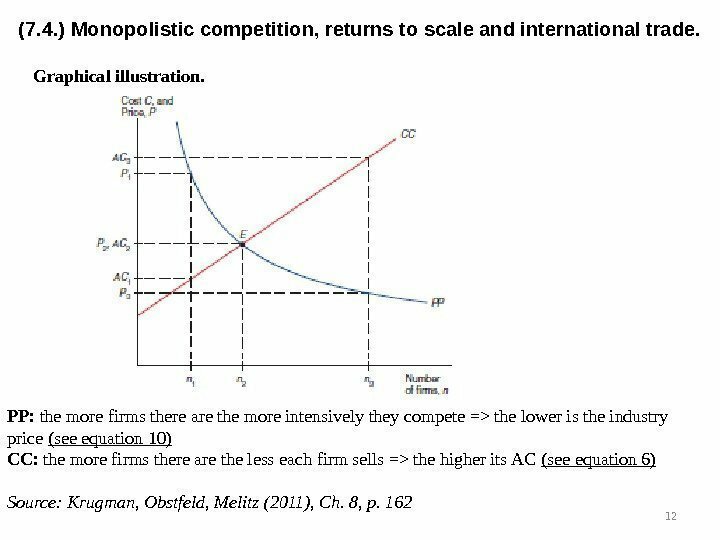 Monopolistic competition, returns to scale and international trade * Why do we need the assumption of imperfect competition here? (7. 4. ) 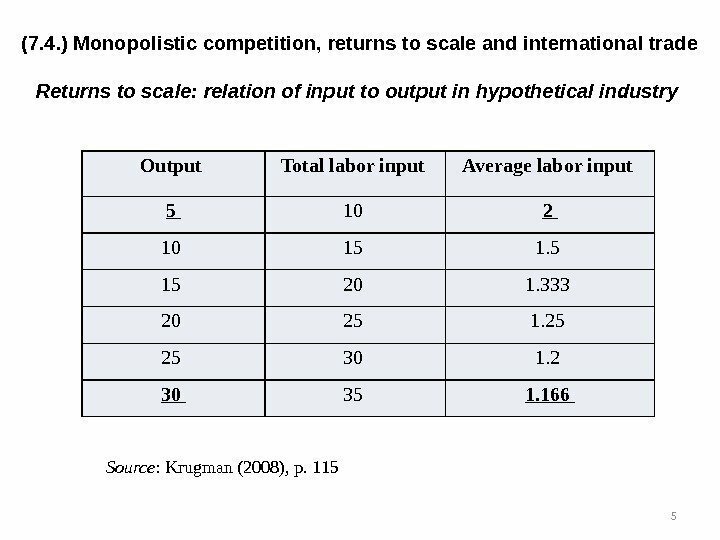 Monopolistic competition, returns to scale and international trade Returns to scale: relation of input to output in hypothetical industry Source : Krugman (2008), p. 115 Output Total labor input Average labor input 5 10 2 10 15 1. 5 15 20 1. 333 20 25 1. 25 25 30 1. 2 30 35 1. The world economy • 2 countries (h, f) • Final good is tradable • Production factor is immobile between the countries Structure of Dixit-Stiglitz model Production • One production factor: labor • The final good (a manufactured good ) is differentiated • There is a set of potential varieties of the differentiated good that can be produced • Any number of the varieties belonging to this set can be produced • In fact varieties 1 to N are produced, where N is a large number, but smaller than the potentially possible one Consumption • Tastes are identical and homogeneous among the households and the countries • Love of variety Market structure • Monopolistic competition on the market of manufactured good • Perfect competition on the production factor market _________________________________ Krugman, P. , Obstfeld, M. and M. Melitz (2011) International Economics: theory and policy – Ch. 8 – pp. 159 -169; Determining marginal revenue: p. 191 )(7. 4. ) 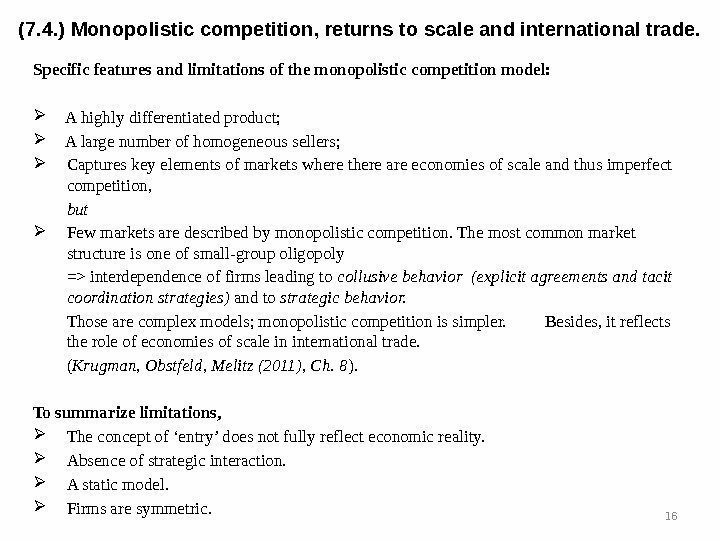 Monopolistic competition, returns to scale and international trade. Formulation of the model Assumptions Production: (3) where C – total costs F – fixed costs (the source of economies to scale) c – marginal costs Q – output (4) where AC – average costs(7. 4. ) 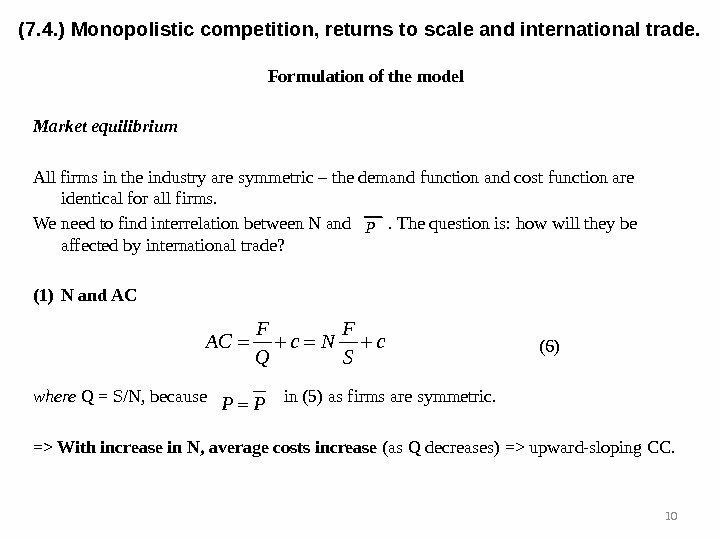 Monopolistic competition, returns to scale and international trade. 9 C F c. Q C F AC c Q Q What happens to average costs when the output increases? Why? Graphical illustration. (7. 4. ) 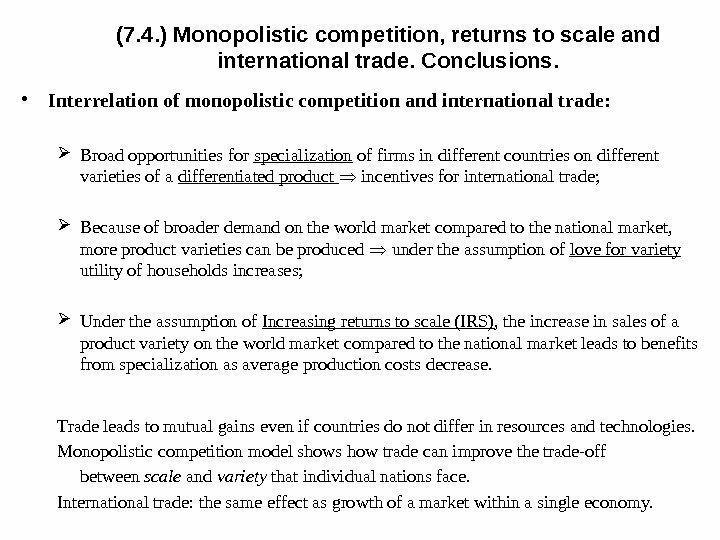 Monopolistic competition, returns to scale and international trade. 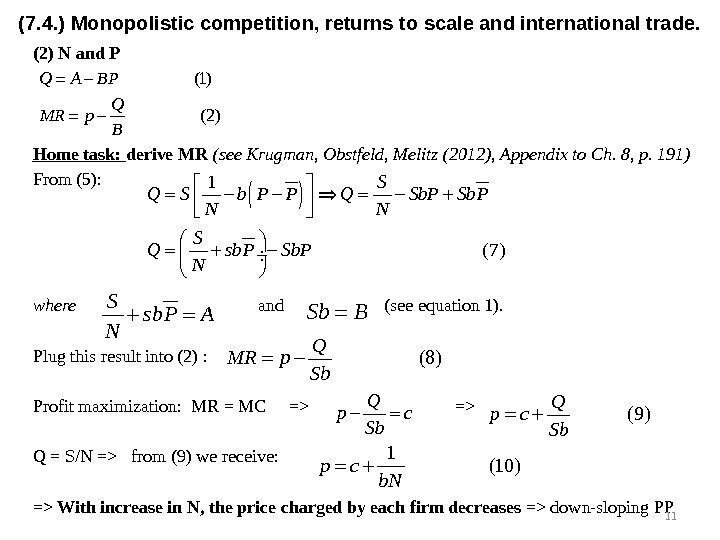 12 PP: the more firms there are the more intensively they compete => the lower is the industry price (see equation 10) CC: the more firms there are the less each firm sells => the higher its AC (see equation 6) Source: Krugman, Obstfeld, Melitz (2011), Ch. 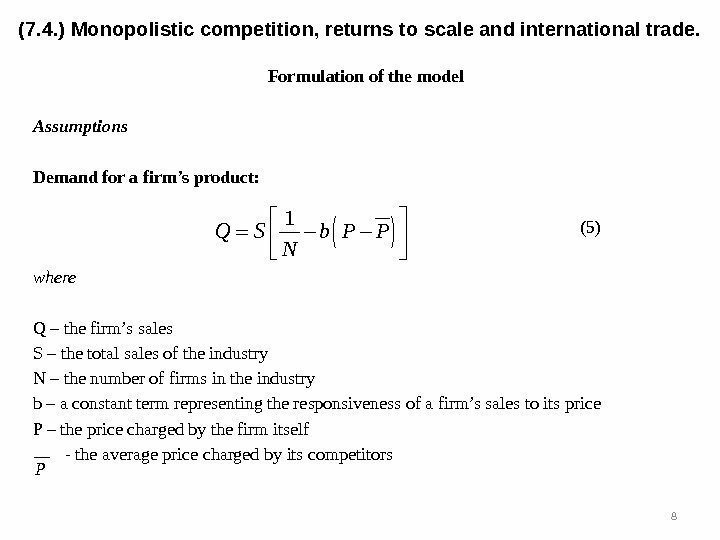 8, p.
Within the model of a monopolistically competitive industry developed here we can determine the equilibrium number of firms and the average price the firms charge. 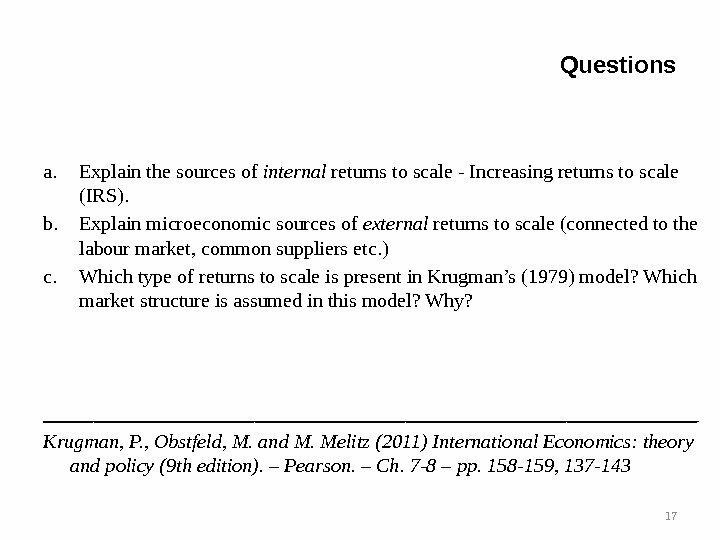 This model can be used to derive conclusions about the role of economies of scale in international trade. Suppose that two countries of identical size and identical characteristics* start trading. The reason behind trade in monopolistic competition model: an opportunity to export a differentiated good and to benefit from Increasing returns to scale. Openness to trade results into increase of the market size (here: population L increases 2 times) 13* Would there be reasons for trade within the Smith model? The Ricardian model? The H-O-S model? (7. 4. ) 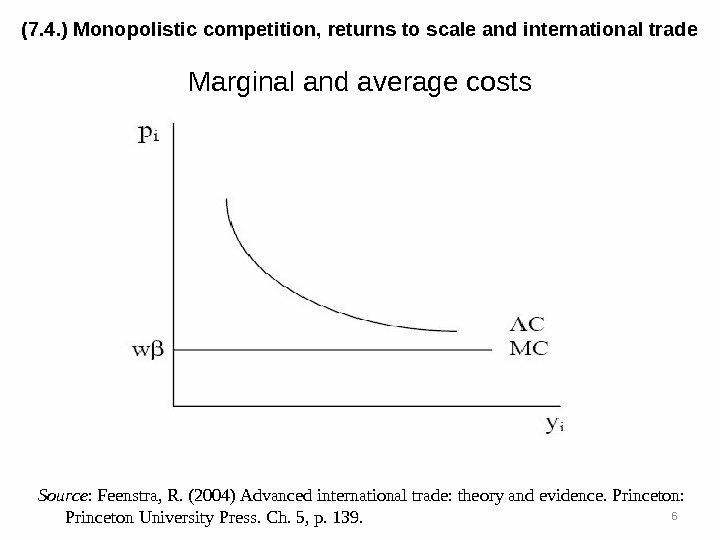 Monopolistic competition, returns to scale and international trade. 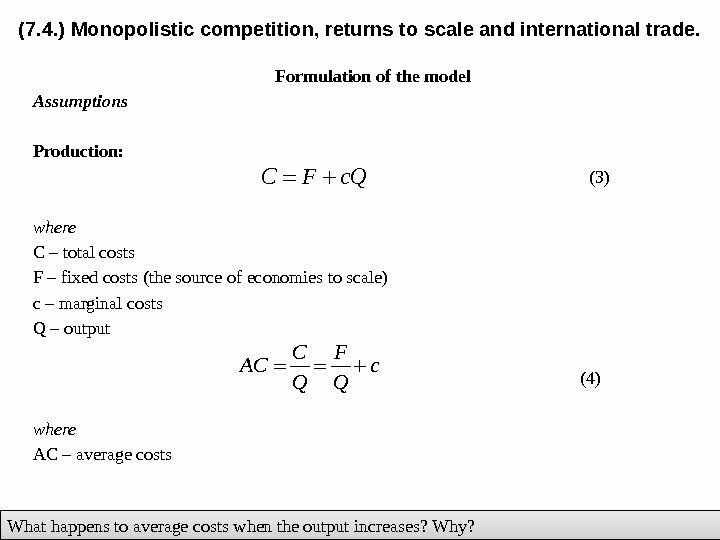 International trade in monopolistic competition model. Economic growth. Each country will produce a narrow range of varieties and consume all varieties. • Price of each variety decreases (I); • The number of firms serving each country’s market increases => the number of varieties available to each consumer increases (II). (I), (II) => consumers gain from trade. Source: Krugman, Obstfeld, Melitz (2011), Ch. 8, p. 165 14(7. 4. ) 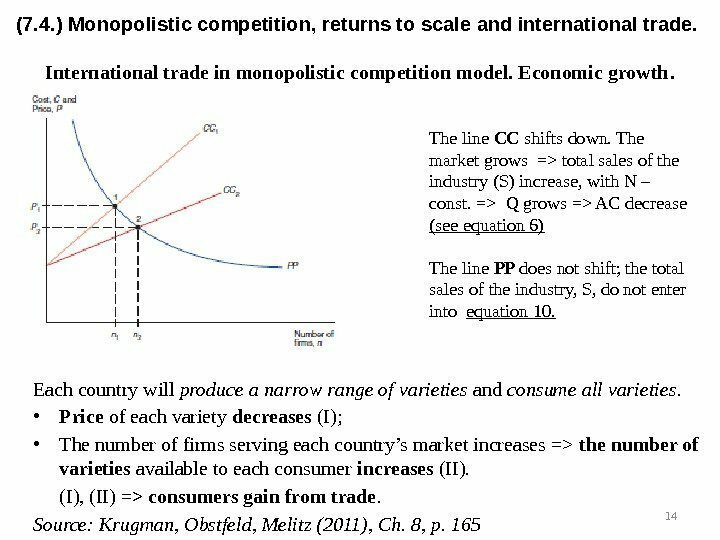 Monopolistic competition, returns to scale and international trade. 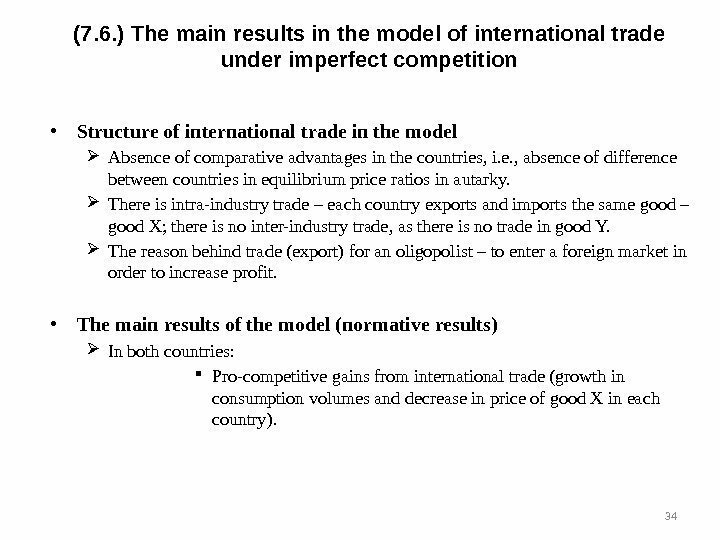 International trade in monopolistic competition model. Economic growth. The line CC shifts down. The market grows => total sales of the industry (S) increase, with N – const. => Q grows => AC decrease (see equation 6) The line PP does not shift; the total sales of the industry, S, do not enter into equation 10. (7. 4. ) 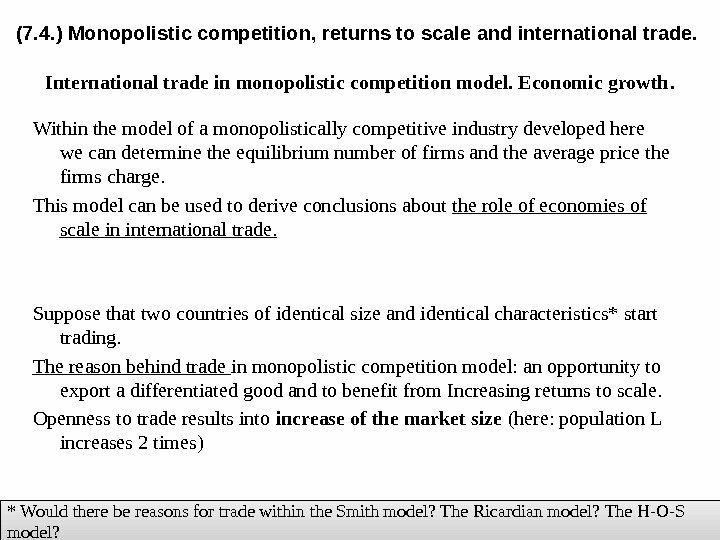 Monopolistic competition, returns to scale and international trade. Conclusions. • Interrelation of monopolistic competition and international trade: Broad opportunities for specialization of firms in different countries on different varieties of a differentiated product incentives for international trade; Because of broader demand on the world market compared to the national market, more product varieties can be produced under the assumption of love for variety utility of households increases; Under the assumption of Increasing returns to scale (IRS) , the increase in sales of a product variety on the world market compared to the national market leads to benefits from specialization as average production costs decrease. Trade leads to mutual gains even if countries do not differ in resources and technologies. 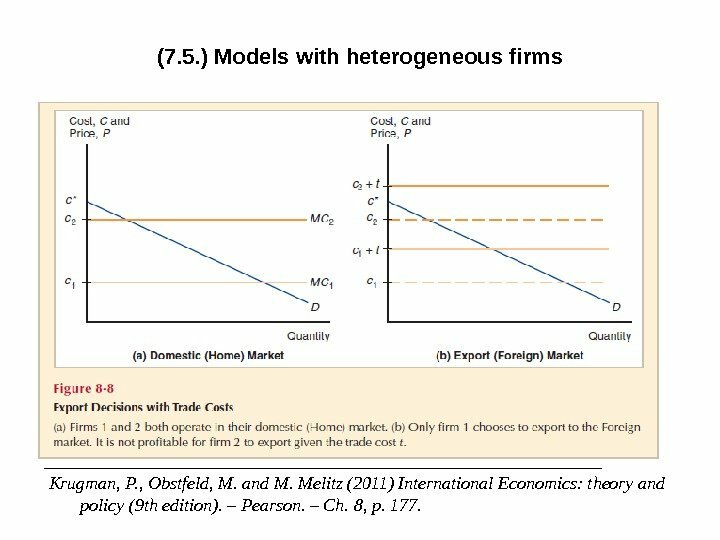 Monopolistic competition model shows how trade can improve the trade-off between scale and variety that individual nations face. International trade: the same effect as growth of a market within a single economy. Specific features and limitations of the monopolistic competition model: A highly differentiated product; A large number of homogeneous sellers; Captures key elements of markets where there are economies of scale and thus imperfect competition, but Few markets are described by monopolistic competition. The most common market structure is one of small-group oligopoly => interdependence of firms leading to collusive behavior (explicit agreements and tacit coordination strategies) and to strategic behavior. Those are complex models; monopolistic competition is simpler. Besides, it reflects the role of economies of scale in international trade. 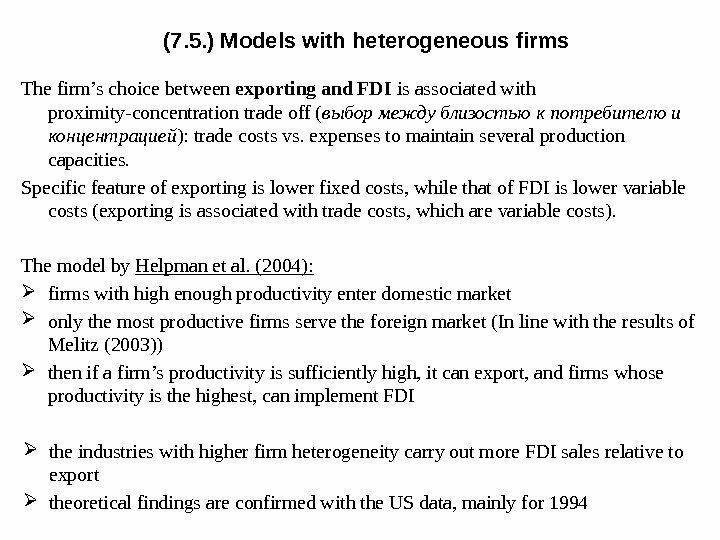 ( Krugman, Obstfeld, Melitz (2011), Ch. 8 ). To summarize limitations, The concept of ‘entry’ does not fully reflect economic reality. Absence of strategic interaction. A static model. Firms are symmetric. 16(7. 4. ) 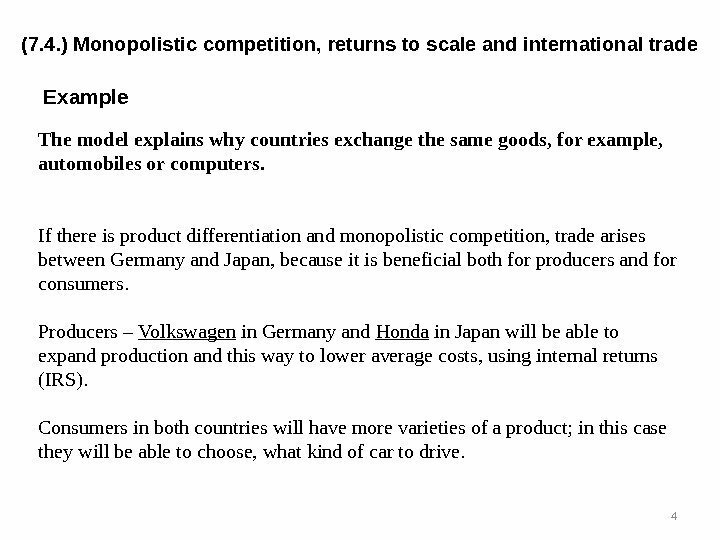 Monopolistic competition, returns to scale and international trade. (7. 5. ) 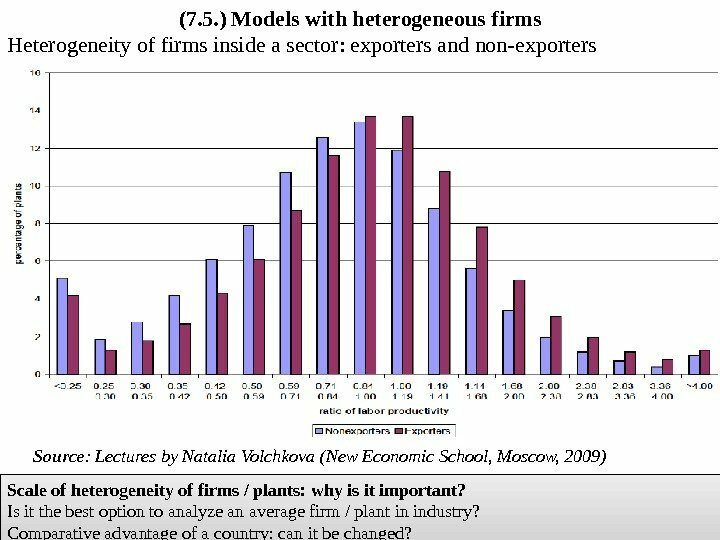 Models with heterogeneous firms Heterogeneity of firms inside a sector: exporters and non-exporters Source : Lectures by Natalia Volchkova (New Economic School, Moscow, 2009) 18 Scale of heterogeneity of firms / plants: why is it important? Is it the best option to analyze an average firm / plant in industry? Comparative advantage of a country: can it be changed? (7. 5. ) 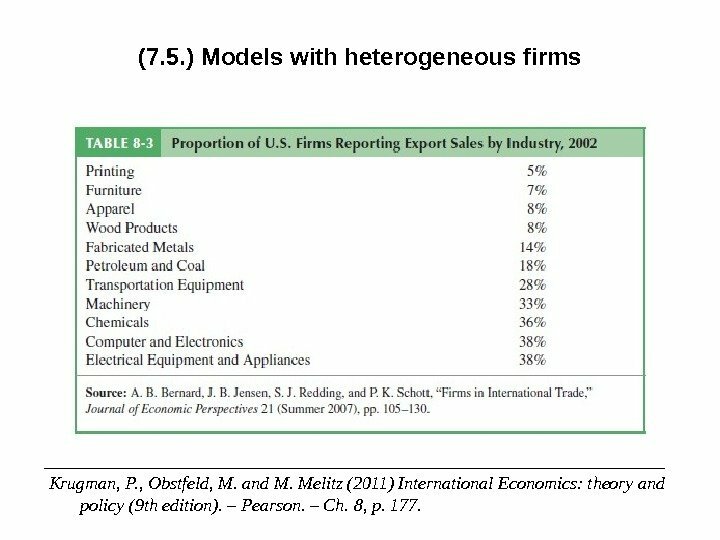 Models with heterogeneous firms ___________________________________ Krugman, P. , Obstfeld, M. and M. Melitz (2011) International Economics: theory and policy (9 th edition). – Pearson. – Ch. 8, p. 177. (7. 5. ) 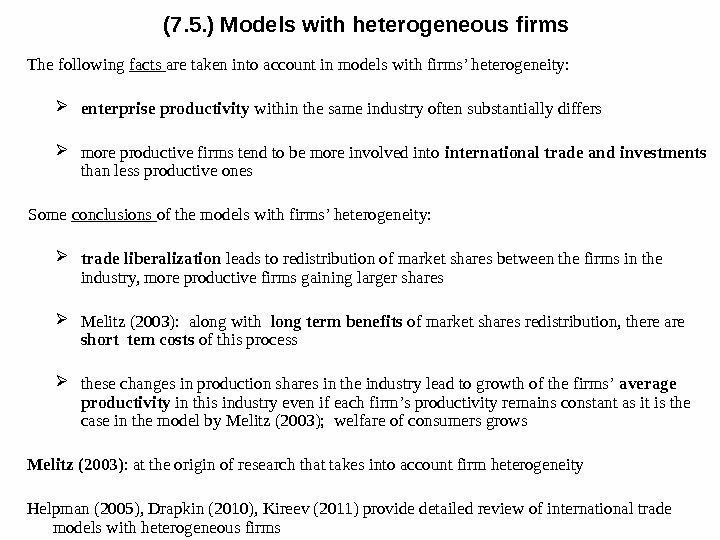 Models with heterogeneous firms The results of the models with heterogeneous firms developed by Bernard et al. 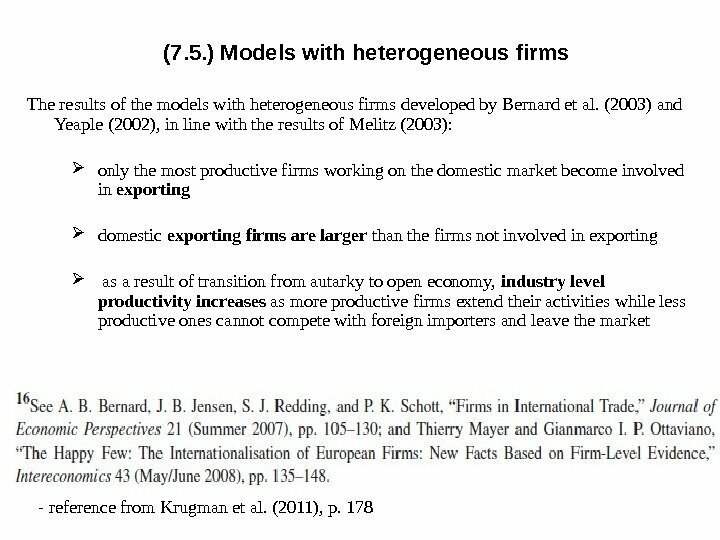 (2003) and Yeaple (2002), in line with the results of Melitz (2003): only the most productive firms working on the domestic market become involved in exporting domestic exporting firms are larger than the firms not involved in exporting as a result of transition from autarky to open economy, industry level productivity increases as more productive firms extend their activities while less productive ones cannot compete with foreign importers and leave the market — reference from Krugman et al. (2011), p.
(7. 6. ) 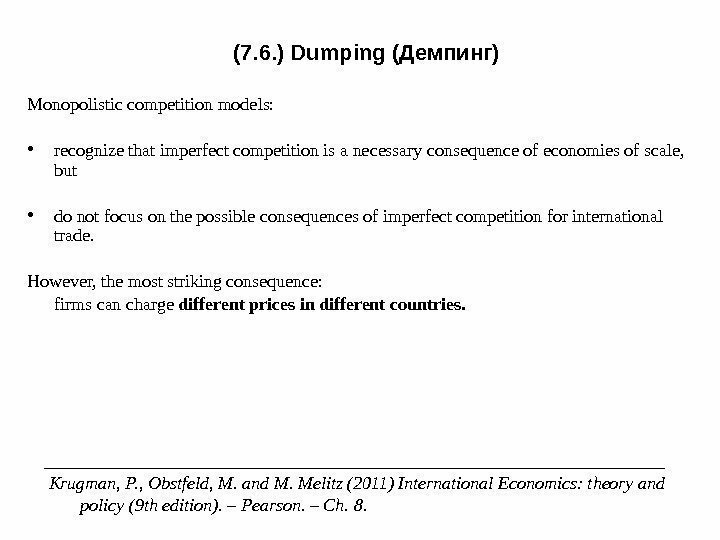 Dumping (Демпинг) Monopolistic competition models: • recognize that imperfect competition is a necessary consequence of economies of scale, but • do not focus on the possible consequences of imperfect competition for international trade. However, the most striking consequence: firms can charge different prices in different countries. ___________________________________ Krugman, P. , Obstfeld, M. and M. Melitz (2011) International Economics: theory and policy (9 th edition). – Pearson. – Ch. 8. (7. 6. ) 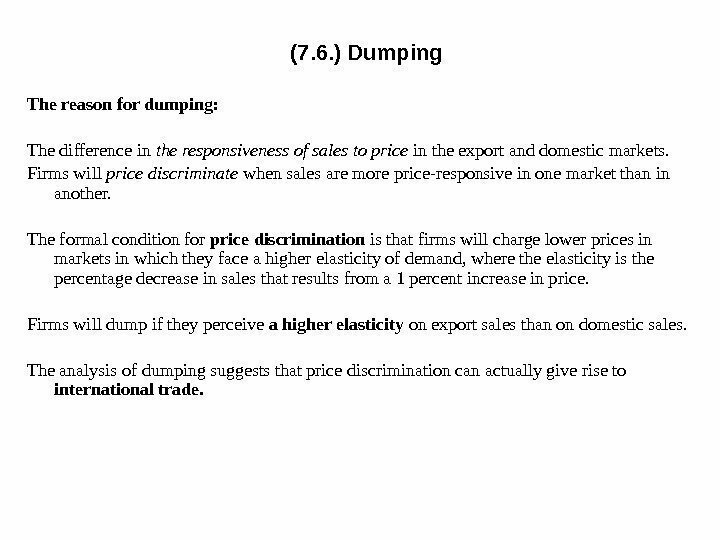 Dumping • The practice of charging different customers different prices is called price discrimination. • The most common form of price discrimination in international trade is dumping , a pricing practice in which a firm charges a lower price for exported goods than it does for the same goods sold domestically. • Dumping is a controversial phenomenon, subject to rules and penalties. 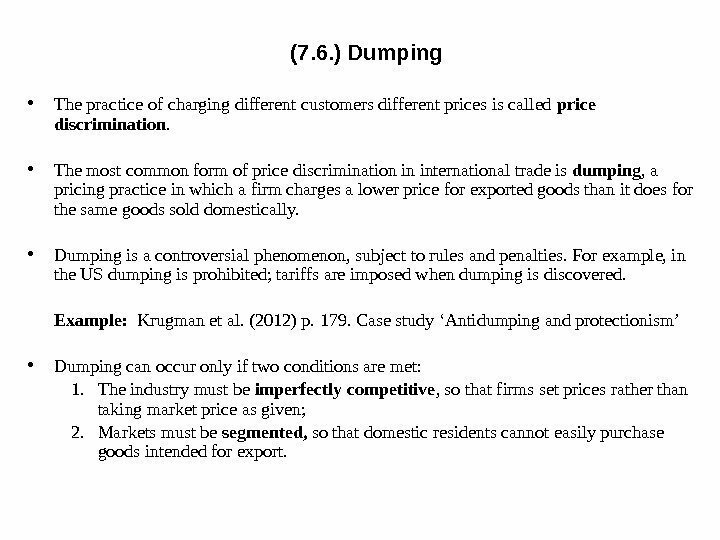 For example, in the US dumping is prohibited; tariffs are imposed when dumping is discovered. Example: Krugman et al. (2012) p. 179. 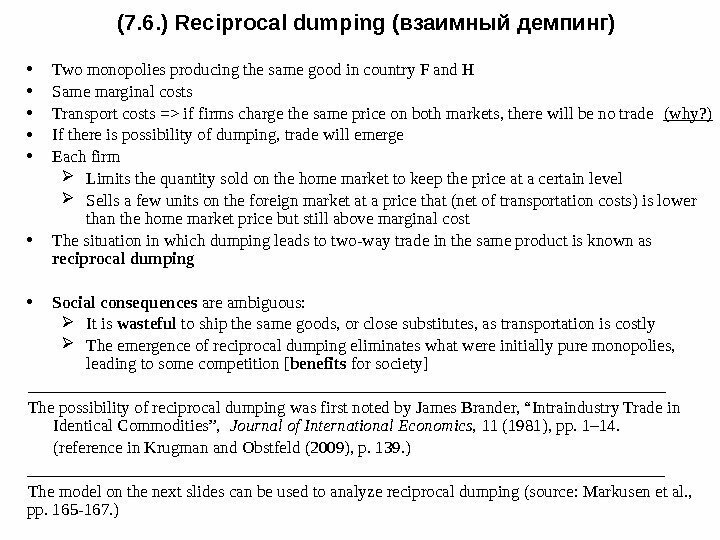 Case study ‘Antidumping and protectionism’ • Dumping can occur only if two conditions are met: 1. The industry must be imperfectly competitive , so that firms set prices rather than taking market price as given; 2. Markets must be segmented, so that domestic residents cannot easily purchase goods intended for export. (7. 6. ) Dumping The reason for dumping: The difference in the responsiveness of sales to price in the export and domestic markets. Firms will price discriminate when sales are more price-responsive in one market than in another. The formal condition for price discrimination is that firms will charge lower prices in markets in which they face a higher elasticity of demand, where the elasticity is the percentage decrease in sales that results from a 1 percent increase in price. Firms will dump if they perceive a higher elasticity on export sales than on domestic sales. The analysis of dumping suggests that price discrimination can actually give rise to international trade. (7. 6. ) 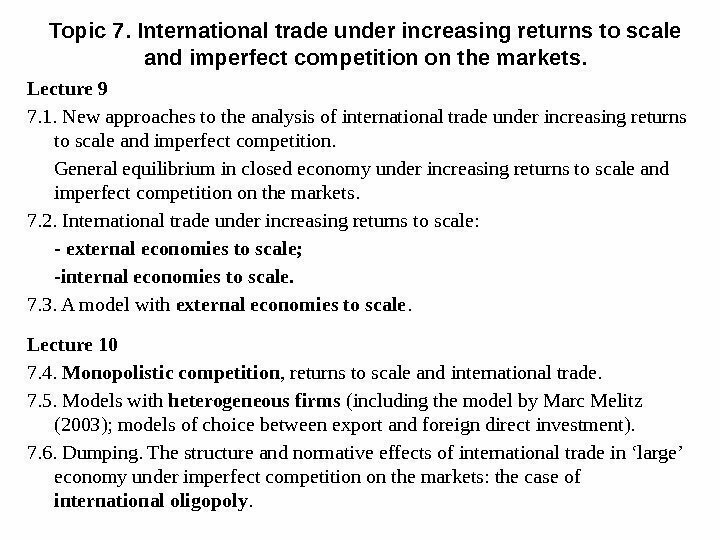 Structure of the international trade model under imperfect competition: the case of international oligopoly • Structure of the world economy : 2 countries (h, f); All final goods are tradable Production factors are immobile between the countries. • Structure of the production sector : 2 industries that produce 2 final homogeneous goods (X, Y); 2 homogeneous non-specific production factors (K, L), mobile between industries; Countries do not differ in absolute factor endowment; Specific features of the production technology: CRS; Technologies differ among the industries, but not among the countries. • Structure of the household sector: Tastes are identical and homogeneous among the households and the countries. • Market structure: Perfect competition on the markets of production factors in both countries; Perfect competition on the market of good Y in both countries; Monopoly on the market of good X in both countries; On the world market of good X – non-price Cournot competition. (7. 6. ) 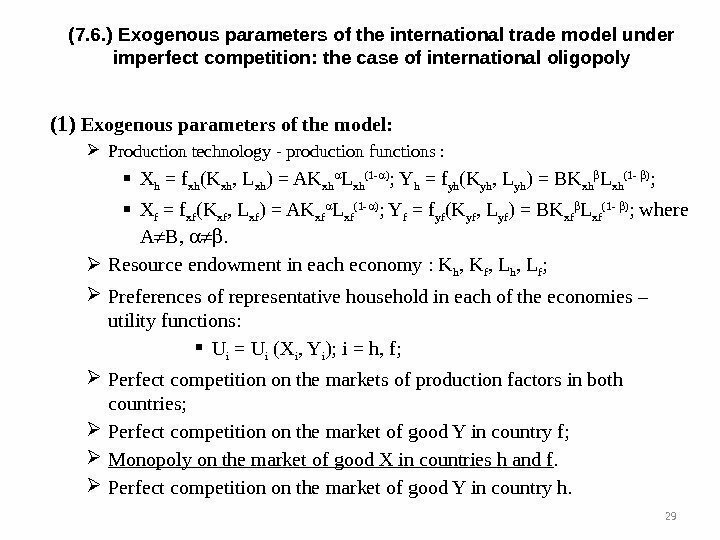 Exogenous parameters of the international trade model under imperfect competition: the case of international oligopoly (1) Exogenous parameters of the model: Production technology — production functions : Х h = f xh (K xh , L xh ) = AK xh L xh (1 — ) ; Y h = f yh (K yh , L yh ) = BK xh L xh (1 — ) ; Х f = f xf (K xf , L xf ) = AK xf L xf (1 — ) ; Y f = f yf (K yf , L yf ) = BK xf L xf (1 — ) ; where А В, . Resource endowment in each economy : K h , K f , L h , L f ; Preferences of representative household in each of the economies – utility functions: U i = U i (X i , Y i ); i = h, f; Perfect competition on the markets of production factors in both countries; Perfect competition on the market of good Y in country f; Monopoly on the market of good X in countries h and f. Perfect competition on the market of good Y in country h.
(7. 6. ) 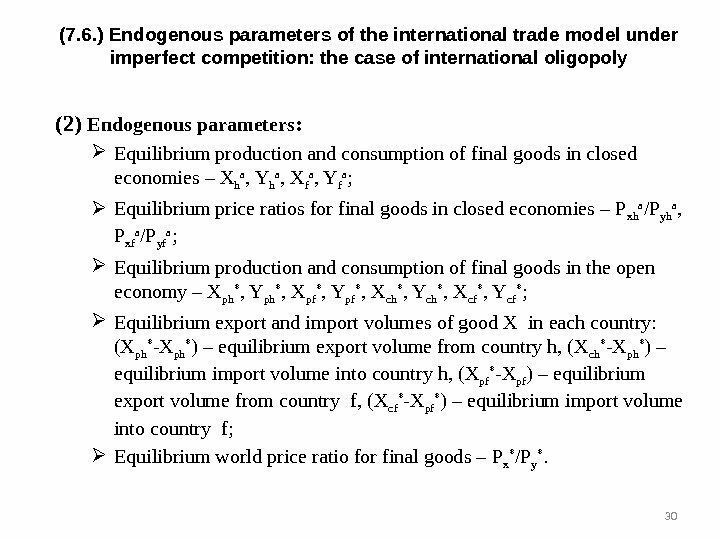 Endogenous parameters of the international trade model under imperfect competition: the case of international oligopoly (2) Endogenous parameters : Equilibrium production and consumption of final goods in closed economies – X h a , Y h a , X f a , Y f a ; Equilibrium price ratios for final goods in closed economies – P xh a /P yh a , P xf a /P yf a ; Equilibrium production and consumption of final goods in the open economy – X ph * , Y ph * , X pf * , Y pf * , X сh * , Y сh * , X сf * , Y сf * ; Equilibrium export and import volumes of good X in each country: (X ph * -X ph * ) – equilibrium export volume from country h, (X ch * -X ph * ) – equilibrium import volume into country h, (X pf * -X pf ) – equilibrium export volume from country f, (X cf * -X pf * ) – equilibrium import volume into country f; Equilibrium world price ratio for final goods – P x * /P y *. (7. 6. ) 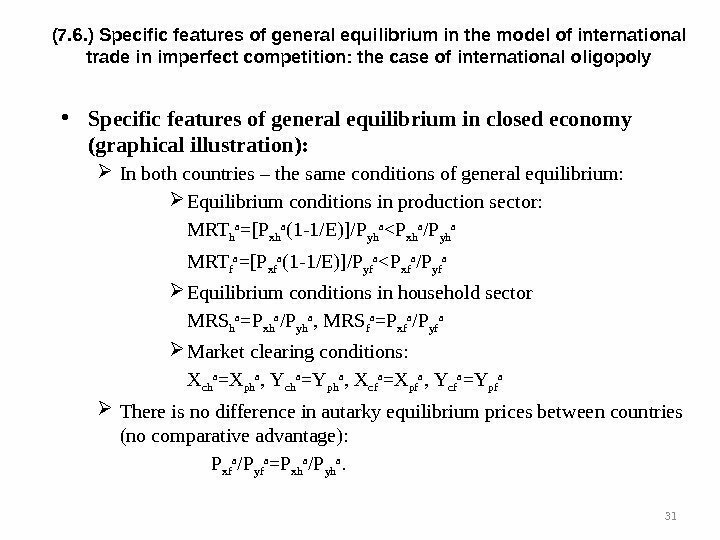 Specific features of general equilibrium in the model of international trade in imperfect competition: the case of international oligopoly • Specific features of general equilibrium in closed economy (graphical illustration): In both countries – the same conditions of general equilibrium: Equilibrium conditions in production sector: MRT h а = [P xh а (1 -1/E)]/P yh а <P xh а /P yh а MRT f а =[P xf а (1 -1/E)]/P yf а <P xf а /P yf а Equilibrium conditions in household sector MRS h а =P xh а /P yh а , MRS f а =P xf а /P yf а Market clearing conditions: X ch а =X ph а , Y ch а =Y ph а , X cf а =X pf а , Y cf а =Y pf а There is no difference in autarky equilibrium prices between countries (no comparative advantage): P xf а /P yf а =P xh а /P yh а. (7. 6. ) 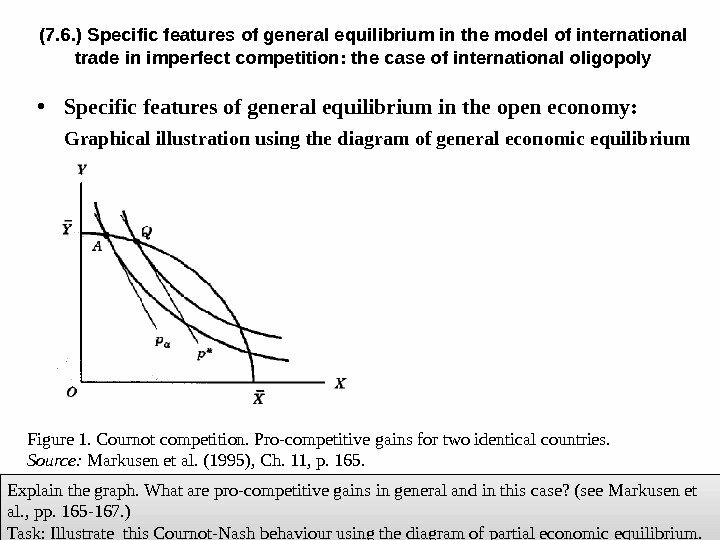 Specific features of general equilibrium in the model of international trade in imperfect competition: the case of international oligopoly • Specific features of general equilibrium in the open economy: Graphical illustration using the diagram of general economic equilibrium 32 Explain the graph. What are pro-competitive gains in general and in this case? (see Markusen et al. , pp. 165 -167. ) Task: Illustrate this Cournot-Nash behaviour using the diagram of partial economic equilibrium. Figure 1. Cournot competition. Pro-competitive gains for two identical countries. Source: Markusen et al. (1995), Ch. 11, p. 165. (7. 6. ) 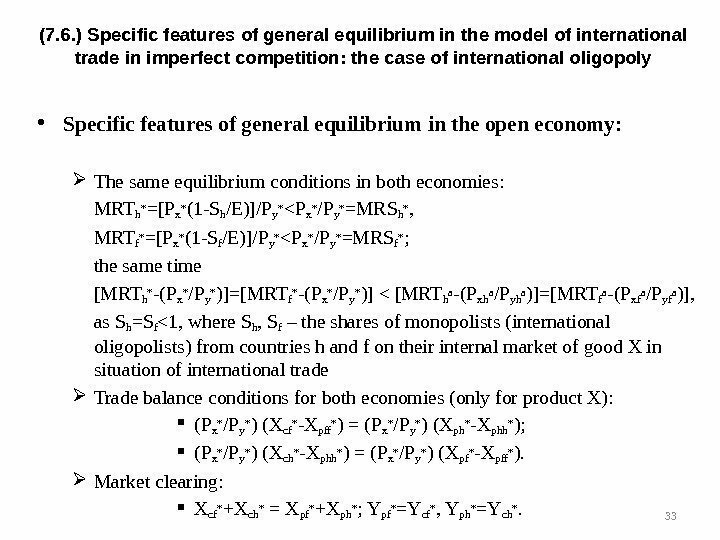 Specific features of general equilibrium in the model of international trade in imperfect competition: the case of international oligopoly • Specific features of general equilibrium in the open economy: The same equilibrium conditions in both economies: MRT h * = [P x * (1 -S h /E)]/P y * <P x * /P y * =MRS h * , MRT f * =[P x * (1 -S f /E)]/P y * <P x * /P y * =MRS f * ; the same time [MRT h * -(P x * /P y * )]=[MRT f * -(P x * /P y * )] < [MRT h а -(P xh а /P yh а )]=[MRT f а -(P xf а /P yf а )], as S h =S f <1, where S h , S f – the shares of monopolists (international oligopolists) from countries h and f on their internal market of good X in situation of international trade Trade balance conditions for both economies (only for product X): (P x * /P y * ) (X cf * -X pff * ) = (P x * /P y * ) (X ph * -X phh * ); (P x * /P y * ) (X ch * -X phh * ) = (P x * /P y * ) (X pf * -X pff * ). Market clearing: X cf * +X сh * = X pf * +X ph * ; Y pf * =Y сf * , Y ph * =Y ch *. (7. 6. ) 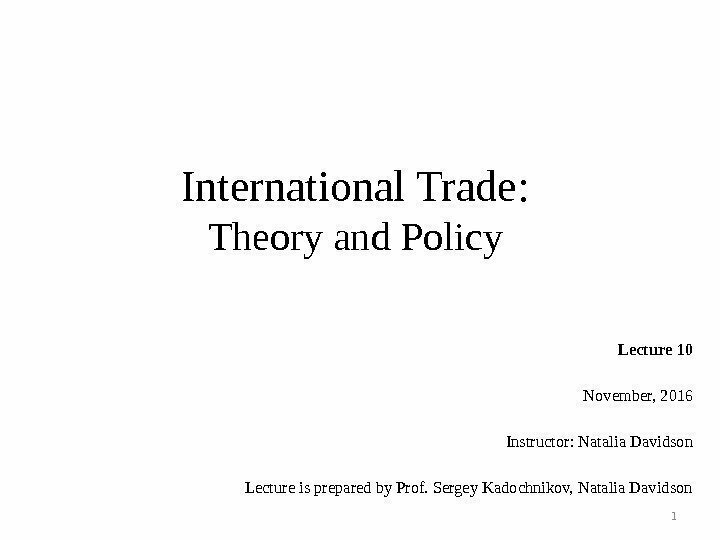 The main results in the model of international trade under imperfect competition • Structure of international trade in the model Absence of comparative advantages in the countries, i. e. , absence of difference between countries in equilibrium price ratios in autarky. There is intra-industry trade – each country exports and imports the same good – good X; there is no inter-industry trade, as there is no trade in good Y. The reason behind trade (export) for an oligopolist – to enter a foreign market in order to increase profit. • The main results of the model (normative results) In both countries: Pro-competitive gains from international trade (growth in consumption volumes and decrease in price of good X in each country). 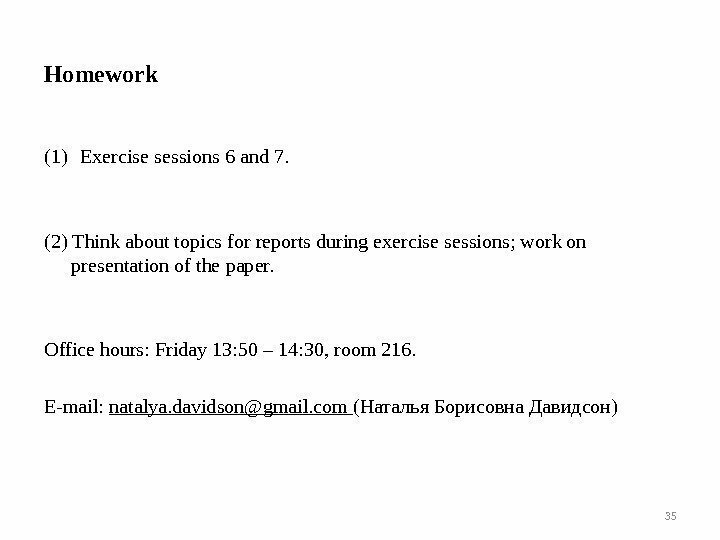 The next lecture: Topic 8. 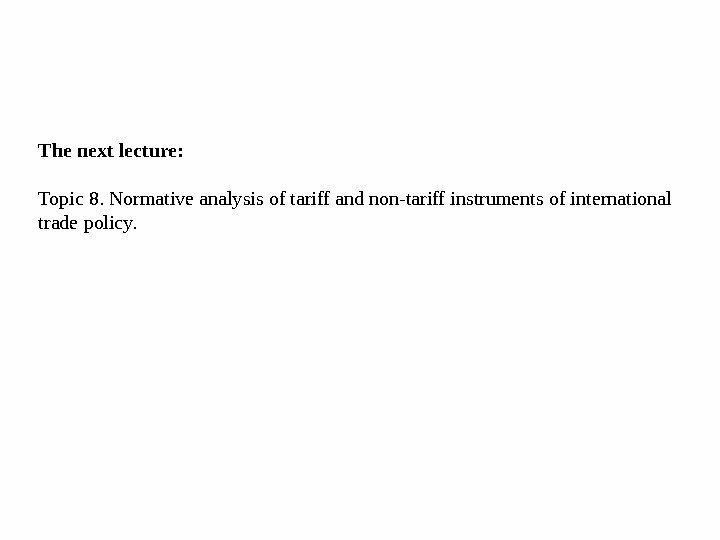 Normative analysis of tariff and non-tariff instruments of international trade policy.